Jane Holl Lute, the Special Coordinator on Improving the United Nations Response to Sexual Exploitation and Abuse, briefs journalists at Headquarters. The number of allegations of sexual exploitation and abuse committed by personnel serving with the United Nations dropped from 165 in 2016 to 138 last year, according to the latest report by the UN Secretary-General on implementing a zero-tolerance policy for these crimes. The Special Coordinator on Improving UN Response to Sexual Exploitation and Abuse, Jane Holl Lute, outlined some of its main messages during a press conference at UN Headquarters in New York on Tuesday. “The report underscores the Secretary-General’s consistent message that no one serving under the UN flag should be associated with sexual exploitation and abuse,” she said. Ms. Lute said data from 2017 indicates a “downward trend” in the number of allegations reported. Overall, there were 138 allegations last year, compared to 165 in 2016. Of this number, 62 concerned personnel deployed to UN peacekeeping and special political missions: down from 104 the previous year. However, she said allegations emanating from other UN entities and their implementing partners increased over the same period: from 42 to 75. At the same time, there was “a sharp decline” in allegations involving non-UN forces, from 18 in 2016 to one in 2017. Ms. Lute reminded journalists of measures the UN has implemented over the past year since Secretary-General António Guterres launched a system-wide strategy to prevent and respond to sexual exploitation and abuse. The initiatives focus on areas such as putting victims first, ending impunity and increasing partnerships; for example, with civil society. They include the appointment of a Victims’ Rights Advocate, responding rapidly to allegations and ensuring that UN staff understand their responsibilities and obligations to prevent and report incidents. “On ending impunity, the Secretary-General has strengthened mandatory reporting through the development of a uniform incident reporting form,” Ms. Lute continued. The trust fund was established in March 2016. As of December 2017, it stood at $1.89 million in commitments and/or contributions. Additionally, grants have been made available or approved to support victims through projects, services and training in three countries: the Democratic Republic of the Congo, the Central African Republic and Liberia. 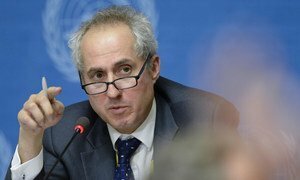 The United Nations has received 40 allegations of sexual exploitation and abuse across its entities and implementing partners for the last three months of 2017, including 15 reported from peacekeeping operations, UN Spokesman Stéphane Dujarric announced on Thursday.